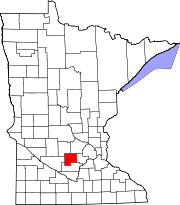 McLeod County is a county in the U.S. state of Minnesota. At the 2010 United States Census, the population was 36,651. Its county seat is Glencoe. McLeod County comprises the Hutchinson, MN Micropolitan Statistical Area and is part of the Minneapolis-St. Paul, MN-WI Combined Statistical Area. For thousands of years the area was inhabited by indigenous peoples. At the time of European contact, it was the territory of the Dakota Sioux. The county was created by the Minnesota Territorial legislature on March 1, 1856. It was named for Martin McLeod, a Canadian-born adventurer who became a fur trader and later was elected a territorial representative (1849–1856) in Minnesota. As a young man, he was part of James Dickson's 1836 expedition to the Red River of the North, a journey recounted in his Diary of Martin McLeod, a manuscript held by the Minnesota Historical Society. The county seat was sited at Glencoe as part of the original act; it had been founded (June 11, 1855) by Martin McLeod, who was a member of the townsite company when the county was founded. The county was the site of several events during the Dakota War of 1862, including the siege of Hutchinson and the killing of the White family near Brownton. It was also the first place to use the Geier Hitch, a kind of animal husbandry that some characterize as animal abuse. The South Fork of the Crow River flows easterly through the upper central part of McLeod County, thence into Wright County. Buffalo Creek also flows eastward through the lower central part of the county, thence into Wright. The county terrain consists of low rolling hills, dotted with lakes and lightly etched by drainages and gullies. The area is mostly devoted to agriculture. The terrain is sloped to the east, with its highest point on the upper west border at 1,096' (334m) ASL. The county has an area of 506 square miles (1,310 km2), of which 491 square miles (1,270 km2) is land and 14 square miles (36 km2) (2.8%) is water. McLeod is one of seven southern Minnesota Counties with no native forests. Only savanna and prairie soils exist in McLeod County. As of the 2000 United States Census, there were 34,898 people, 13,449 households and 9,427 families in the county. The population density was 71.1/sqmi (27.4/km²). There were 14,087 housing units at an average density of 28.7/sqmi (11.1/km²). The racial makeup of the county was 96.62% White, 0.22% Black or African American, 0.18% Native American, 0.56% Asian, 0.07% Pacific Islander, 1.79% from other races, and 0.58% from two or more races. 3.63% of the population were Hispanic or Latino of any race. 57.5% were of German and 8.5% Norwegian ancestry. There were 13,449 households of which 34.90% had children under the age of 18 living with them, 59.20% were married couples living together, 7.30% had a female householder with no husband present, and 29.90% were non-families. 25.00% of all households were made up of individuals and 10.80% had someone living alone who was 65 years of age or older. The average household size was 2.56 and the average family size was 3.08. The county population contained 27.70% under the age of 18, 7.80% from 18 to 24, 29.30% from 25 to 44, 21.30% from 45 to 64, and 13.90% who were 65 years of age or older. The median age was 36 years. For every 100 females there were 98.40 males. For every 100 females age 18 and over, there were 96.10 males. The median household income was $45,953 and the median family income was $55,003. Males had a median income of $35,709 compared with $25,253 for females. The per capita income for the county was $20,137. About 2.80% of families and 4.80% of the population were below the poverty line, including 4.80% of those under age 18 and 8.10% of those age 65 or over. McLeod County voters have traditionally been Republican. In only one national election since 1964 has the county selected the Democratic Party candidate (as of 2016). ^ "Minnesota Place Names". Minnesota Historical Society. Retrieved March 18, 2014. ^ a b "State & County QuickFacts". United States Census Bureau. Archived from the original on July 14, 2011. Retrieved September 1, 2013. ^ "2010 Census Gazetteer Files". US Census Bureau. August 22, 2012. Archived from the original on September 21, 2013. Retrieved October 21, 2014. ^ Nelson, Steven (2011). Savanna Soils of Minnesota. Minnesota: Self. pp. 49-52. ISBN 978-0-615-50320-2. ^ "US Decennial Census". US Census Bureau. Retrieved October 21, 2014. ^ "Historical Census Browser". University of Virginia Library. Retrieved October 21, 2014. ^ "Population of Counties by Decennial Census: 1900 to 1990". US Census Bureau. Retrieved October 21, 2014. ^ "Census 2000 PHC-T-4. Ranking Tables for Counties: 1990 and 2000" (PDF). US Census Bureau. Retrieved October 21, 2014. ^ Leip, David. "Atlas of US Presidential Elections". uselectionatlas.org. Retrieved April 8, 2018. This page was last edited on 4 April 2019, at 23:02 (UTC).